1. 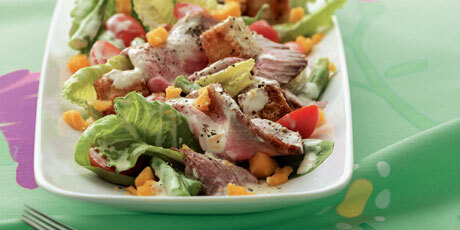 In a large bowl, toss lettuce with about 1/2 cup (125 ml) of the dressing to coat. 1. In a bowl, whisk together milk, mayonnaise, mustard, horseradish, sugar, thyme, salt and pepper; gradually whisk in vinegar. 2. Let stand for 5 min or until thickened.